locomente...: Oops! I fell in love! Oops! I fell in love!! 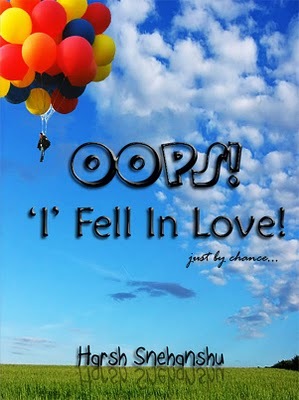 It is the protagonist of the story – Kanav – who has fallen in love!! This is another story woven in the backdrop of IIT-Delhi. And alas!! It happens to be the sequel of Oops! I fell in love! I came to know about it very late though. So, I had no other option, but to read the predecessor. The author was 19 years old himself when he penned the book and so is the protagonist. Therefore, the narrative is very simple… witty and interesting. It is a usual love story with a usual story line. Boy happens to be a single. Yet, confused whether to mingle!! Then, he meets his lady… Love erupts!!! Irrespective of the distance and in spite of the hurdles! I have to admit that I enjoyed reading the book. You can’t stop yourself from recalling those glorious days of crushes… infatuation and love of course!!! I am certain that you would enjoy too!!! Eager to know how kanav and Tanya manage long distance relationship.